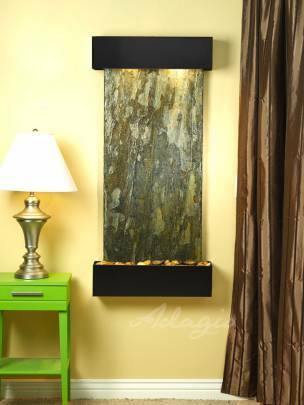 Wall Mount - 50" x 54" x 6"
This indoor waterfall comes with many stone and trim options. Enjoy this water fountain with the sound of running water in your home or office. 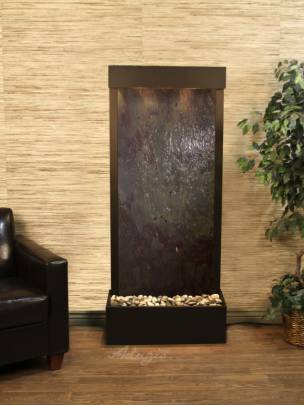 Wall Mount - 25" x 54" x 6"
This indoor wall water feature is perfect for a home or small office. The vertical style make is versatile for almost any space. Wall Mount - 61" x 69" x 6"
Our water fountains are a natural way to humidify your room. 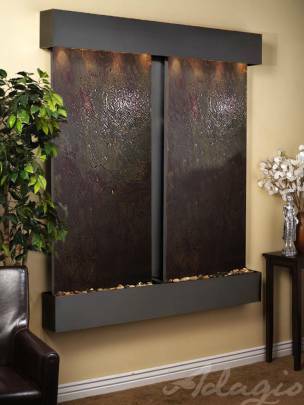 This two surface waterfall is perfect for any living environment. 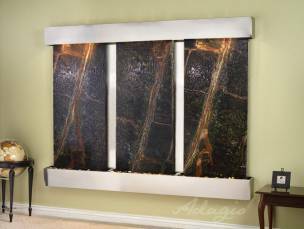 Wall Mount - 91" x 69" x 6"
This three panel waterfall is an impressive site in any home or office environment. Perfect to welcome guests into tranquility. 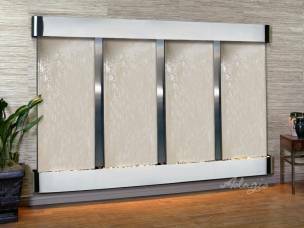 Freestanding - 31" x 70" x 14"
A Harmony River Water Fountain is a beautiful way to have a large indoor waterfall without mounting it to the wall. This fountain can be used inside or outside. 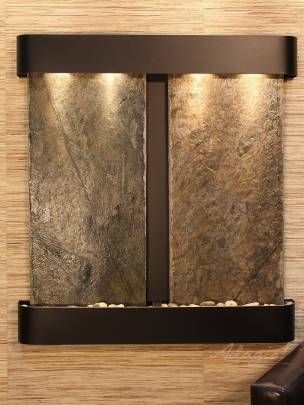 Wall Mount - 30" x 69" x 6"
Customize your indoor water fountain with a company logo, colored LED Lights, or choose the exact stone that will be in your waterfall with our upgrade options. Wall Mount - 54" x 69" x 6"
Our indoor water fountains are easy to install and maintain. This two surface feature has no gap between them perfect for a company logo. 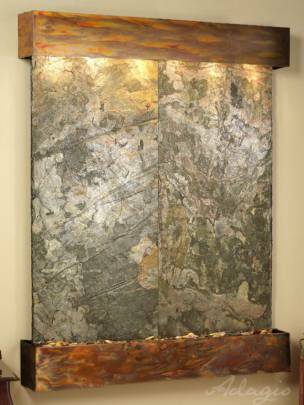 Wall Mount - 75" x 54" x 6"
This is the smaller three surface waterfall we offer. It truly is a soothing piece of art in your home or office. 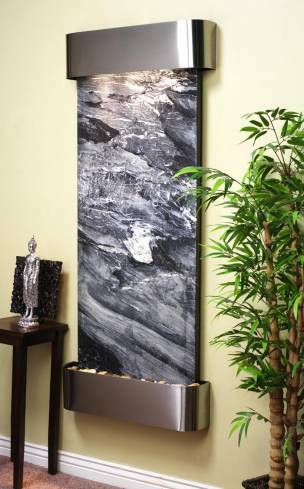 Wall Mount - 38" x 27" x 5"
Bring the soothing sounds of a waterfall into your home with this water feature. 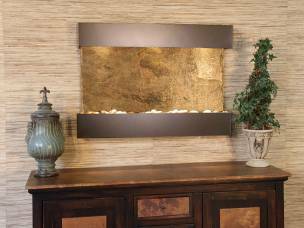 The Reflection Creek is perfect for smaller horizontal spaces. 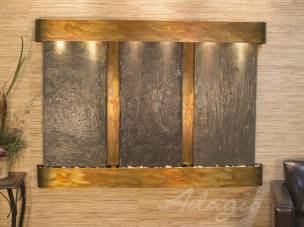 Wall Mount - 120" x 69" x 6"
This four panel water feature is impressive in size. This is our largest wall mounted waterfall. It can be used inside or outside.